Page 269 is up, go spend a few minutes admiring it, then come back here for some notes. Let’s start off with some comments from the artist, the illustrious Mr. Joshua Burnett . . .
1. Leighton and I had some challenges coming up with a name for the supervillain. Most of the good Germanic mythic and “power” names have been taken. We needed a name and concept before we could put together the badguy. All we knew was that I wanted to do a magic-powered costumed villain, something like a mix between Rasputin from Hellboy and Captain Nazi. Fafnir, Blitzkrieg, and Hexenmensch were early contenders. 2. Eventually I came up with a cool costume design that I labeled “Deathshead or Totenkopf.” Leighton and Abi decided on Totenkopf. 3. I’m very happy with how Totenkopf’s costume turned out. It wound up looking a bit like Flag Smasher, Space Ghost, and Black Terror all mixed together. His legs are bare because he’s supposed to be a Golden Age character, and the Golden Age had a lot of super-dudes running around without pants. 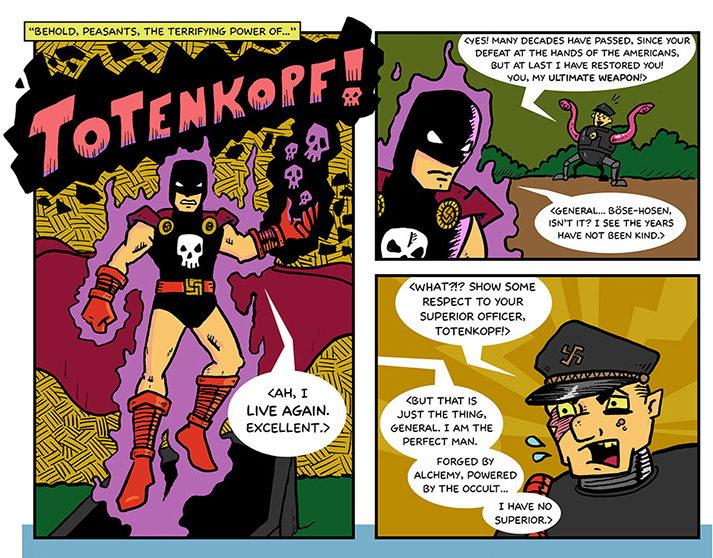 4 .Totenkopf clearly uses the same evil magic that the snake-man in “Swords & Serpents” used. You can tell by the black crackle and skulls. Thanks, Josh! And now we continue on with . . .
5. I also considered “Jormungand” for a name. I really liked “Hexenmensch” (Witch Man) but we’d already been tossing around the word “ubermensch,” and I thought “Hexenmensch the Ubermensch” was too much. 6. As Josh said, he came up with the original premise of doing a mystical super-powered Nazi villain, he designed the costume, and he came up with the name. I had some input, and wrote the dialogue, so I think I’m maybe 5% responsible for Totenkopf, but for all intents and purposes, Josh created the character. Good work, Josh! 7. “Totenkopf” is German for “Death’s Head.” Interestingly enough, Marvel just announced a new series starring their Death’s Head character. I’ve been talking about comic book crossovers lately, and Death’s Head has the most amazing crossover-ific backstory . . . he originally appeared in the Marvel UK Transformers comics, where Galvatron hired him to kill Rodimus Prime, and he eventually ended up under the control of Unicron. But then he ended up in the TARDIS, where the Doctor shrunk him to human size, and dropped him off somewhere in the future, and not longer after that, he came back to the 80s and met the Fantastic Four . . . that’s his canonical backstory! Amazing! 8. I had a different version of this page written, when Josh mentioned that Beowulf should really rip someone’s arm off, since that’s how he beats Grendel in the epic. So I rewrote the end of this page to have him rip off the General’s arm, and it’s much better as a result. 9. The script, which didn’t give any panel breakdowns, said that while Totenkopf and the General talk, Beowulf and Chrysanthemum are fighting Nazis in the background. I figured they would just be visible in the back of a couple of panels, but Josh came up with this neat idea to set the two of them apart from the rest of the page–notice how they’re in a borderless area, set behind the other panels, colored blue to differentiate them from the main action. Josh creates a space out of time, that’s occurring simultaneously with the first three panels. And then all of a sudden, in that next-to-last panel, Beowulf suddenly pops up, and it’s almost surprising. It’s a neat trick. 10. All the other Nazis are down and out, but Totenkopf remains, and Totenkopf is nigh unstoppable! How will Beowulf and Chrysanthemum deal with this Nazi witch man? Tune in next week, electric fans!